Drivers in northern Scotland have been worst affected by rising petrol and diesel prices at the pumps, the AA has said. The average UK price for petrol has risen from last week's record figure of 121.76p a litre to 122.14p. 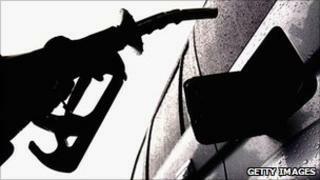 Petrol prices in northern Scotland are now about 130p a litre, with 129.9p in Ullapool and 133.9p in Stornoway. Diesel in the north of Scotland now costs about 135p a litre, with 134.9p in Ullapool and 135.9p in Stornoway. The UK average for diesel has gone up 3.06p a litre between mid-November and mid-December 2010 and now costs an average 126.19p, according to the AA. In Scotland, the average is 126.7p a litre. The price of diesel at the pumps is still lower than its record high. Compared with this time last year, the average cost of filling a 50-litre petrol tank has increased from £54.26 to £61.07. A 50-litre tank of diesel has gone up in price from £54.93 to £63.10. AA president Edmund King said it was a "bleak mid-winter" for drivers. He said: "Milking motorists through higher fuel prices is over, as many are running dry and biting back, not because they want to but because they have no option.